What are mobile payments? What are mobile payment apps? We answer these questions and more. What’s the Difference Between Mobile Payments and Mobile Acceptance? Mobile payments are an increasingly attractive way to pay because they are secure, fast and convenient. Mobile payment use is growing. In fact, according to a recent study, the total mobile transaction is expected to increase by almost 32 percent globally, to USD 1.35 trillion in 2017. And as more consumers become comfortable with the technology, security features are taking center stage. In 2017, mobile payment volume will reach $75 billion and should increase to $503 billion by 2020. Considering the growth of Apple Pay and other NFC payments isn’t slowing down, adapting to mobile payment technology is extremely valuable for your business. Mobile payments (which encompass mobile wallets and mobile money transfers) are regulated transactions that take place through the customer’s mobile device. That is, instead of the customer paying for items or services with cash, checks or physical credit cards, mobile payment technology allows them to do so digitally. One might use mobile payments as an alternative to credit cards because it’s more convenient and secure. Traditional credit cards store the customer’s information on the merchant’s point-of-sale (POS) terminals, while mobile payments do not. When utilizing a mobile payments app, the customer’s mobile device serves as a security token and creates a random code for the transaction, which makes the transaction more secure. As a business owner, you would use a mobile payment app on your mobile device or tablet to accept payments for your goods or services. Mobile payments allow you and your employees to accept payments anywhere, anytime – it’s that simple. You want to make paying for your products and services as easy as possible as a business owner, one of the ways to do this is with mobile payments. How do mobile payments work? To pay with a mobile device at a store’s checkout counter, the customer should hold the mobile device close to the NFC-enabled payments terminal. The reader should not be farther than 10 centimeters away from the source (mobile phone) to set the transaction in motion. Since there’s no physical contact between the mobile device and the payments reader, mobile payments are often referred to as contactless payments. What’s happening in a mobile payment transaction is that the mobile device and the NFC-enabled point-of-sale are essentially talking to each other. Using specific radio frequency, they pass encrypted information back and forth to process the payment. This all takes just seconds. Speed, in fact, is one of the best parts of NFC payments. They take a fraction of the time of magstripe and chip card transactions — and are light-years faster than cash. There’s also something called tokenization at play in a mobile payment transaction. Tokenization is part of why mobile payments are so secure, as the technology safeguards your bank details in mobile payments apps. Make the move to mobile payments and experience the advantage. 11. Near Field Communication (NFC): Near-field communication is the radio technology that allows NFC-enabled devices — cards, smartphones, smartwatches, etc. — to communicate when put into close proximity. Your customers pay with a tap and you accept payments on the go! What is the Difference Between NFC and EMV Mobile Payments? What are NFC mobile payments? NFC stands for near field communication payments and is also referred to as “contactless” payments. These are NFC payments that occur in person between a mobile device and a payments processor that can accept them. To make NFC mobile payments you need to have a mobile wallet app on your device. And to accept an NFC mobile payment at your business, you need a mobile NFC payments reader. NFC mobile payments are widely used by the younger demographic, where the majority of the population tends to use EMV mobile payments, as they are the most secure. However, as a business owner, if the majority of your customer base is made up of Millennials, for example, getting on board with NFC mobile payments can be extremely important. According to the U.S. Census Bureau, Millennials (those born between 1982 and 2000) already outnumber the next-largest generation, the Baby Boomers, and they expect faster customer service than previous generations. Not only do they expect to find what they want, when they want it, but they also expect retailers and brands to process payments and returns as quickly as possible — NFC mobile payments are quick and convenient. Near Field Communication, or NFC, is the technology that powers many popular forms of mobile payments, like Apple Pay, Samsung Pay and Google Pay. In the payments industry, NFC payments are also called contactless payments or CTLS payments, touch-to-pay services, tap-to-pay services, mobile payments and more. What is Near Field Communication? How does it work? Near Field Communication allows smartphone and other devices to communicate with each other when they are in close proximity. They quickly establish a connection and share data over radio waves, all in just seconds, making it a faster method of payment than noticeably sluggish EMV transactions and swipe card transactions. This version of radio technology evolved from Radio Frequency Identification, or RFID, a familiar tool you might recognize as the one used to scan product barcodes or RFID tags. RFID is also commonly used by shipping companies to pull up information on packages. How do you use NFC payments? 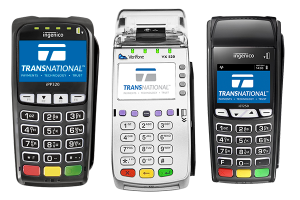 As the merchant, you need an NFC-compatible terminal, POS system and software and/or mobile card reader to accept an NFC mobile payment from a customer. Click here to get a free quote on NFC-compatible devices for your business. Why should I accept NFC payments? Even though the adoption and usage of mobile NFC payments or contactless payments has been slow so far, payments experts say that usage will increase dramatically over the next few years as more NFC-enabled smartphone, tablets and mobile devices are rolled out. Adoption of Apple Pay, Samsung Pay and Google Pay is steadily increasing, along with other mobile wallets/rewards apps like the Starbucks mobile app. NFC payments are also a more secure and fast way to pay than EMV chip cards and traditional swipe cards. Your customers don’t have to carry around a physical wallet and worry about losing their credit cards, debit cards, cash and checks — and possibly have their identity stolen in the midst of it all. You can also benefit from accepting NFC payments because you can integrate your customer loyalty or rewards program so that customers can redeem coupons, discounts and rewards with just a tap of their mobile device. Wondering how to start using NFC payments? What are EMV mobile payments? EMV stands for Europay, MasterCard and Visa and is a global standard for credit cards that use computer chips to authenticate (and secure) chip-card transactions. EMV cards (AKA chip cards) are the new, more secure credit cards that the U.S. continues to transition to. EMV mobile payments encrypt bank information making it far more secure than the old magstripe cards. This is important given the U.S. has a pretty serious issue with credit card fraud. So how exactly will this affect your business? For starters, you’ll need a new processing device to read the information in the chip cards. And as of October 2015, businesses that don’t have an EMV processing device could be on the hook for fraudulent chip card transactions. (This is something called the “liability shift”). For merchants and financial institutions, the switch to EMV means adding new in-store technology and internal processing systems, and complying with new liability rules. Mobile NFC payments or mobile EMV payments — either way, mobile credit card processing is an increasingly attractive way to accept credit card payments because it’s quick, convenient and highly secure. Mobile payment solutions (such as the TransNational Payments mobile payments app) enable merchants to run mobile transactions from any smartphone or tablet. Accept credit card and cash payments, keep track of inventory and sales from anywhere — take your business with you with the power of EMV mobile payments. Protect your business from fraud liability with EMV mobile payments. Our mobile payments equipment is user-friendly and keeps you secure. 1. What are mobile payments? Mobile payments are regulated transactions that take place digitally via a mobile device like a smartphone or tablet. Specifically for businesses, mobile payments are when you are using an app on your mobile device (phone or tablet) to accept payment for goods or services from your customer. There are mobile EMV payments, mobile NFC payments (AKA contactless payments) and much more within the greater category of mobile credit card processing. 2. What is a mobile wallet? A mobile wallet is a digital application that securely stores credit card details so that your customer can pay for things digitally. How do you use a mobile wallet? A consumer can download a mobile wallet application on their phone and add credit or debit card information that will be protected by mobile encryption. Most mobile wallets require thumbprint authorization (or other security measures) in order to access the credit card or debit card numbers within the mobile wallet to pay. 3. How do mobile payments work? 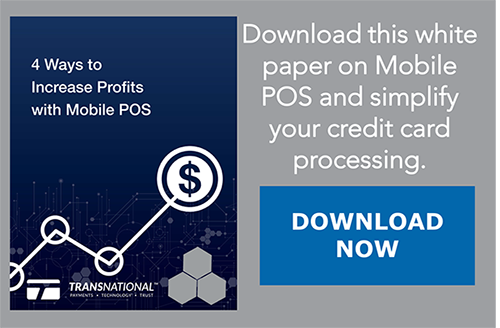 A turnkey mobile point-of-sale (mPOS) solution, like TransNational Payments’ Mobile Payments Solution, is an app that offers a great mPOS solution for merchants who want to accept mobile transactions. The app is iOS and Android compatible and makes it easy for merchants to take mobile payments. Mobile payment apps are used by a wide range of merchants, including: beauty and barber shops, doctors and dental offices, in-home services businesses, nail salons, parking lots and valets, restaurants, retail shops and dozens of other types of businesses looking to take payments on-the-go. 4. What are the benefits of mobile payments? Mobile payments are secure, fast and convenient. Most importantly, they allow you to take your business and payments anywhere so that you can make more sales and gain new customers. Also, mobile EMV card readers are often less expensive than a traditional EMV credit card processing terminal and provide more features. 5. What’s the future of mobile payments? Because of their enhanced security features and convenience, mobile payment adoption will continue to increase. Now that the merchant services industry is fully utilizing modern technology to take payments mobile, mobile payments are becoming an increasingly affordable and attractive way for customers to pay. The development of EMV mobile payments and NFC payments has dramatically boosted the popularity of this solution with customers, so it’s a smart bet for merchants to work on mobile acceptance as soon as possible. In 2017, mobile payment volume will reach $75 billion and should increase to $503 billion by 2020. Are you ready to take payments mobile? Still have questions on mobile payments? Our payment specialists can tell you whether mobile payments are a fit for your business. On the peer-to-peer side of things, utilizing mobile money transfer apps allows you to forgo the hassle of cash and checks, and get paid quicker. And for in-store purchases, mobile payments are the best solution for a number of reasons. With devices and capabilities growing over the past few years, mobile has become the new game-changer. Here’s why you should embrace the change to the benefit of your operations, and your revenue. Mobile payments are by far the fastest way to pay — usually taking about a second. In the U.S. the transition to EMV as the credit card standard continues and we are seeing mobile payments adoption increase because it is a far better experience and more cost effective. 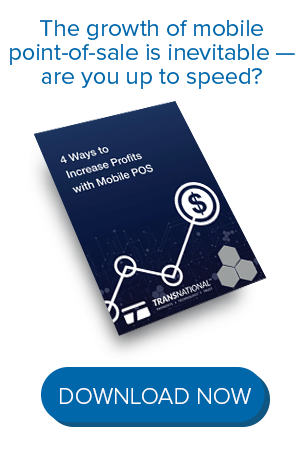 And for businesses that have checkout queues (QSRs, retailers), mobile payments are much more attractive as they can move the line faster (which means more sales in a shorter amount of time). We’ve all heard of Nordstrom and if you’ve been there lately, you’ve probably noticed sales associates walking around with mobile devices. Nordstrom has seen significant success with the decrease in line sizes alone, not to mention the better customer experience they’ve managed to create with the additional information that is available to employees with the mobile devices. Mobile payments let you and your employees accept payments anywhere, anytime — it’s that simple. Accept credit card (and cash) payments and keep track of inventory and sales anywhere your business takes you. As merchants you want to make paying for your products and services as easy as possible, and one of the ways to do this is with mobile payments. Mobile payments allow you and your employees to accept payments away from a normal cash register, such as on the retail floor or from a food truck on the side of the road. Another plus, allowing customers to pay for products and services with their smartphones instead of with cash or credit cards, makes it easier for them, all the while, you can increase your revenue, improve customer satisfaction and learn more about your customers’ spending habits. Mobile payments have multiple layers of dynamic encryption, making them an extremely secure way to pay. They’re far more secure than magstripe payments and just as secure as EMV chip card payments. Even better, if you choose the right mobile payments partner, they should be able to support mobile payments with EMV, like TransNational Payments does. Find out more about What Consumers Want From Mobile Payments: A Primer for Merchants. The fact that mobile payments are fast, convenient and secure, not only appeals to consumers, it also appeals to your employees and we all know how important it is to keep your employees happy. Being able to accept payments anywhere gives employees the flexibility they need to keep customers happy, in turn, helping them succeed. Long lines are a turnoff for many shoppers, for example, and may even cause customers to leave without their merchandise. To prevent this, merchants can give staff mobile credit card processing devices so they can break up lines. Rather than having only one checkout station, staff can operate throughout the store so customers can purchase items as soon as they’re ready to go. This also provides a one-to-one transaction that provides greater opportunity for customer engagement and even upsells. When staff members are given tablets and other mobile payment devices, they can also pull up information for customers and educate them on additional products that might interest them. Customers expect mobile payment options, which most likely means that your competitors have already fulfilled their wishes. Even if not explicitly true, this assumption should be the method of businesses wishing to stay ahead of the market. Moving to mobile alone has its own benefits, but doing so before your competitors helps cement the perception that your company cares about your customer needs, and has its finger on the pulse of web and technological development. Consumers’ thoughts on mobile payments have revolutionized the way businesses are thinking about payment processing. On one front, we’re moving toward more secure, authenticated ways to process payments. And on another, we’re moving toward faster, more convenient ways to pay. Brands like Starbucks and CVS have created apps that allow you to save payment information and favorite products, so you can refill a prescription or order your favorite coffee drink with the tap of a button. Not to mention, on the merchant end, mobile app devices are considerably less expensive than the usual payment terminal. It's time to go mobile! See the benefits of mobile payments for yourself. We have complied a list of the important features you should consider as table stakes when exploring mobile payment apps for your retail, HVAC, plumbing, car dealership, restaurant, medical office or B2B business. The app should have a history screen that shows transaction status, transaction number, date and time, and the ability to send a receipt or issue a full refund. Item lists individual sellable items with price, quantity on hand and taxability within your mobile payments app. 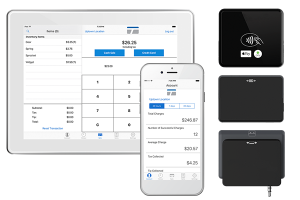 This feature turns your mobile payments app into a “light” point-of-sale system. The ability to send a receipt when using the mobile payments app is critical for your small business. We recommend having the ability to email or text a receipt. Being able to configure your signature requirements within the mobile payment app is important. For EMV transactions the requirements for a signature CVM (customer verification method) are driven by the transaction itself. The ability to control sales tax, even on a per item basis, is important. If you collect tips from your customers, having this option within your mobile payments app will be important. We recommend a mobile payment app that allows you to preset default tip amounts or enter a custom dollar amount. Offline mode enables capturing swiped or keyed payments without an internet connection or cell reception. Wondering how to make the move to mobile payments? Experience the benefits of adding mobile payments to your business. One of our helpful payment experts will create a free savings analysis and answer any of your questions on mobile credit card processing. We’ll recommend the best products — whether you need card readers, a payment gateway, mobile-ready credit card terminals or a mPOS system — and you just decide where you want to start. In as little as one day, our installations team will set up your mobile payment equipment for you, and mobile acceptance is easy — just download our mobile app and connect your card reader. Mobile payments are a cost-effective solution for millions of small and mid-sized businesses. You'll stay ahead of the competition with quick and easy mobile payments. Order your mobile-ready device now! We'll match your business to the right mobile equipment and software. You take payments mobile. Today’s customer expects a wide variety of payment options, and the shift from cash and checks to credit or debit cards isn’t expected to reverse anytime soon. But now (in just the last few years for the U.S.), there’s another player you need to be aware of: mobile payments. A mobile payment means that a customer used their smartphone, tablet or smartwatch, all types of personal mobile devices, to pay for something. It’s critical that you decide whether mobile payments are a fit for your business (we can help!) based on your average customer. Making iPhone credit card processing and Android credit card processing on mobile easy for merchants is what we do! Equally important is whether your business will support mobile acceptance, which means that you, the merchant, can accept traditional swipe payments, EMV chip cards and/or NFC contactless payments on your mobile device (smartphone or tablet). A mobile payment means that your customer wants to pay you using their personal smartphone, tablet or wearable device like a smartwatch. These types of mobile payments are also called NFC payments, contactless payments or touch-to-pay services. This is because your customer will tap or hold their mobile device a few inches from your terminal, POS system or card reader, which will read it and complete the transaction. The top mobile payments apps includes Apple Pay, Samsung Pay and Google Pay. Your customer’s payment info is stored on their device, but your store needs to have the correct terminal/credit card machine, POS system and software, or mobile card reader so they can securely pay you with their mobile device. Customers access their payment information using biometrics like fingerprint scanner or facial recognition, or by unlocking their smartphone, accessing an app and unlocking it with another form of password. When they pay, this payment information is submitted to you, so your business needs to be able to encrypt or tokenize that data. With their credit or debit cards digitally stored on these “mobile wallets” or “digital wallets,” your customers have no need for a physical wallet. In addition, because your customer’s card data is accessible only after authentication, their card data is safe and secure on their device, and customers have tighter control over the security of their personal payment information. On the other side of mobile payments, mobile acceptance means that you, the merchant, can accept card payments using your mobile device. You can do this with your smartphone, tablet or wearable device like a smartwatch. You may have seen other merchants and vendors at a farmers market, music festival or trade show accepting credit card and debit card payments on their smartphone or tablet with an insertable card reader or card swiper. There are user-friendly options for a variety of smart mobile devices, including: card readers for iPhone; card readers for Android; Bluetooth card readers; EMV chip card readers and/or NFC card readers; and card readers that you simply insert into your device’s audio jack. To accept mobile payments, you, the merchant, simply download a mobile application, plug in the card reader (or connect it to your mobile device via Bluetooth), connect to a Wi-Fi or cellular data connection. With that, you’re ready to start accepting mobile payments! Accepting mobile payments empowers you to take your business, products or services and brand to a wider audience and make more sales than by just accepting cash, check or credit cards alone. Mobile payments AND mobile acceptance can increase your sales. These readers are 100% portable; as they are not tied to a landline and can go anywhere your mobile device goes. It’s ideal to have a separate cell phone just for business, however, to keep information separate and secure. Portable credit card readers work over a simple internet connection, such as Wi-Fi or 4G, however this does give rise to various threats—antivirus software is recommended. The costs of using them are minimal. Cell phone credit card processing simply gives merchants more flexibility and accessibility than in-store terminals. For example, your can business can receive same-day payments at the time of service and/or next-day funding thanks to cell phone credit card processing. On-the-go field service workers, such as plumbers, HVAC specialists and more, can accept payments right away instead of billing customers. Obviously payment needs vary by merchant, and those needs will dictate whether traditional or mobile card processing is the right fit. But it’s beneficial to have different processing options, as these business owners want to please their customers. When utilizing a traditional machine, merchants must buy or lease the terminal itself. Along with this, a point-of-sale system will be required, which includes necessary hardware and operational software to make and process sales. A few ways these machines actually work is through a connection to the location’s landline phone or through a desktop computer’s internet connection. Once the terminal is operational, customers need only swipe their cards through the machine to make purchases. Traditional terminals are capable of processing not only credit and debit cards but also gift cards and sometimes checks. Remote purchases are made possible by key entry, where an employee will type in card details manually for customers who call or send in orders. Additionally, businesses using this model are expanding their purchase options by providing the opportunity to buy online. It’s important to understand mobile payments compared to traditional terminals. Traditional processing methods are ideal in a few different circumstances. Users of traditional terminals may not have the need for the freedom of portability, as they run brick-and-mortar businesses like storefronts or restaurants and hardly work in the field. Additionally, not everyone is eager to switch to tech-savvy methods, as technology is hard to adjust to. However, those who DO require the convenience of portability, such as craft show merchants or landscapers, welcome the likes of mobile credit card processing. So which one is better for your business? The convenience and affordability of mobile payments? Or a traditional terminal? Increase sales at your business. Mobile payment processing technology allows merchants to accept more payment types and broaden their customer base, which means they’ll be empowered to drive more revenue. Simply attach the card reader to a smartphone or tablet, and you are ready to accept payments wherever business takes you. Expand your business to new venues and customer types by selling your products at farmer’s markets, festivals or trade shows. Today’s customers expect to be able to pay using a debit or credit card—or even their smartphone—everywhere, so make sure your business offers this convenience. Reduce waiting time for your customers. Using mobile card readers in your locations also enables you to deliver better customer service and reduce wait times. Don’t risk a customer walking out the door because he or she doesn’t have time to wait in a long checkout line. Instead, you can equip your sales associates with mobile credit card processing tools so they can serve more customers, more quickly right on the sales floor. When your team is able to meet and speak with customers right in the midst of their purchase decision, they can more effectively engage with each customer on a personal basis and offer relevant upsells. When sales associates accept payments on a tablet right on the sales floor, they can simultaneously take advantage of the opportunity to pull up specific product data for customers to let them know which additional products might suit their needs. If you’re a small to mid-sized business, you know that scouring your payments data for ways to improve your operation can be a tedious process that often falls to the wayside. By implementing mobile payment processing technology, you can more easily track customer data. Use this data to implement new campaigns and promotions and to increase revenue. You’ll also have quick access into the behavior of individual customers, including how frequently they come in, how much they spend and what their preferred payment method is. Restaurants can also use data from their at-table POS systems to understand how diners use the technology and what their most popular orders are. Use this information to deliver more options based on what real customers want and to tailor your offerings based on customer behavior. Boost loyalty and customer satisfaction. When guests are happy with your product and the experience they receive from your business, they are more likely to be loyal, repeat customers. Accepting payments via a mobile device helps to improve the customer experience, which can, in turn, help to boost loyalty. Using a mobile POS system enables your staff to better communicate with each other, allowing them to serve your customers better and more efficiently. For example, in a restaurant, accepting payments via a mobile device right from the table can significantly decrease the time it takes for a server to accept payments—especially over the course of a busy day. In a retail store, your sales team can meet the customer right where they are, on the sales floor, to accept payment via a tablet without risking losing the sale to long wait times. Having the tablet in hand also enables your associates to quickly search inventory and make personalized product recommendations as they’re interacting one-on-one with the customer. Your customers will appreciate the individual attention and quick access to product information. Mobile payment processing solutions certainly aren’t just for retail stores. Restaurants are also a key industry that can benefit from mobile payment processing tools. Some of the largest U.S. eatery chains have installed tablet devices at each table, allowing diners to pay for their drinks and food on their own time so they don’t have to wait for the server to bring their bill. Recent research has found that over 50 percent of restaurant visitors are currently interested in using this type of payment technology if it were available at the restaurants they frequent. Don’t get left behind in the popularity of these new solutions. At-table payment processing technology can also help increase ticket size. Tablets equipped with POS systems can be programmed to display targeted ads at certain points in the dining experience, encouraging patrons to purchase another round of drinks or to order a dessert to share. When diners order their next round of drinks or a dessert right from the tablet at their table, your staff are freed up to more quickly deliver food or clear tables for other guests. When you implement mobile merchant services, you give your customers more options for how to pay. What’s more, you’ll also reap many benefits for your operations, your business, and your staff. You can expand your business to new locations, gain actionable insights on your payments processing and improve the customer experience. Cost: One valid advantage is the lower cost of using a mobile card reader or barcode scanner than having a credit card terminal from a bank, which charges merchants with monthly fees plus transaction fees. Engagement: Offering mobile payment options to customers both online and offline simply makes the purchase process easier for them. This can increase conversion rates and the number of returning customers. Moreover, businesses are able to speed up the checkout process and capture the business of impulse buyers who may have been less able to buy something if a traditional transaction were required. Convenience: They make the payment process easier and less complicated. Now customers can make payment anywhere at anytime with their mobile devices connected with Internet. They allow customers to seamlessly purchase products or services without having to physically handover cash or swipe a card. Consumers are eager for quick, in-and-out shopping experiences. Security: By using mobile payment, consumers no longer have to assume the security risks associated with cash or worry whether they have enough cash in their bulky physical wallets so that mobile payments reduce theft risks of having cash on hand. Moreover, mobile payment is a secure way to pay. Credit card information are not stored on smartphones directly but in the cloud. So no thief could extract your credit card details just by stealing your phone. By the way, iTunes has the world’s biggest credit card database. Mobile payments are safe and simple. Get a free quote on mobile payments now!